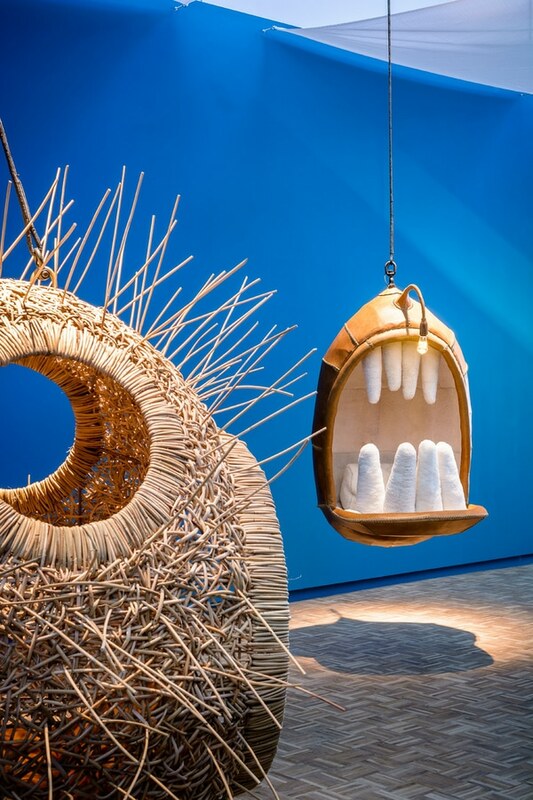 South African designer Porky Hefer is showing a killer-whale-shaped chair from his Monstera Deliciosa collection of animal-themed "nests" at Design Miami. Fiona Blackfish has a stitched grey, white and black leather exterior completed with a tail, dorsal fin and flippers. 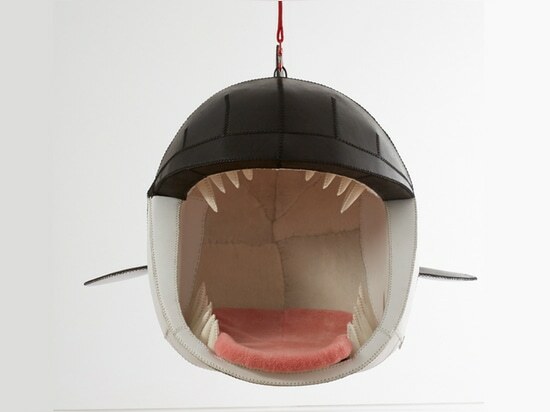 It features a furry pink tongue-shaped seat inside the whale's mouth, surrounded by leather teeth. It is hung using a red length of rope that has been spliced – a knotting technique more commonly used on yachts for adding strength. The rope has a matching red hook that attaches to a loop at the top of the chair. 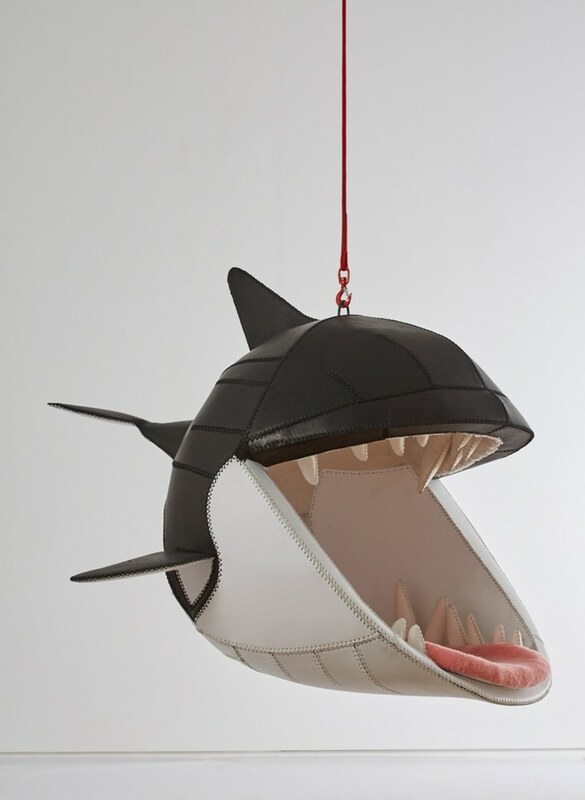 The whale is part of Southern Guild's exhibition of South African collectible design during Design Miami from 1 to 6 December. 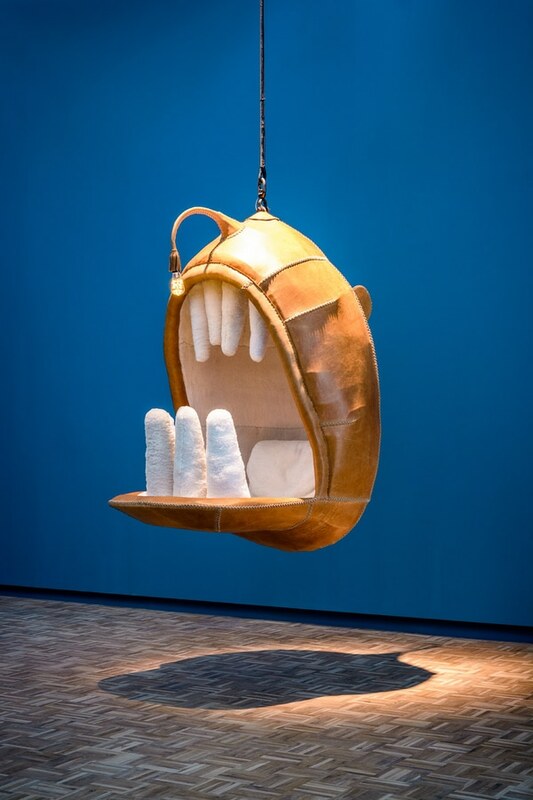 It is from Porky Hefer's Monstera Deliciosa collection of animal-shaped chairs, six more of which are currently on display in the designer's solo show at Southern Guild's Cape Town gallery, which runs until 5 February. 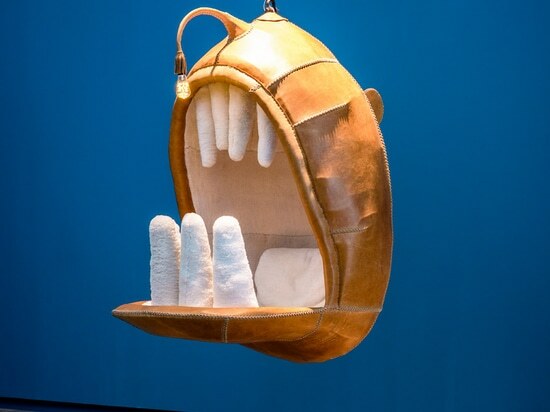 Other animals represented as seats in the Cape Town exhibition include a pelican, whose enlarged brown-leather beak creates an egg-shaped seat, a manta ray, and a crocodile. 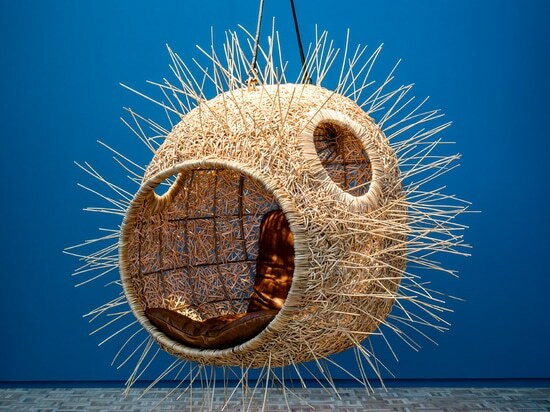 A puffer fish and a four-legged creature have been woven out of Kooboo Cane instead of being made from stitched leather like the other pieces. 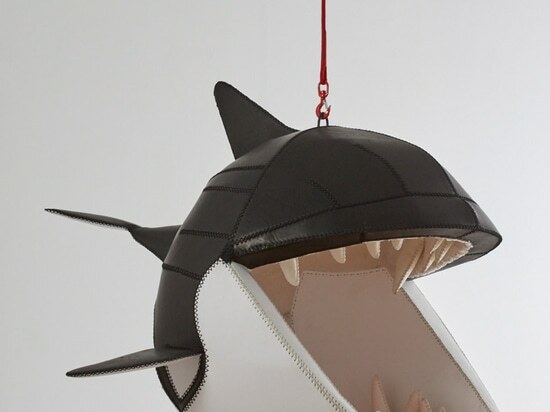 The final piece is a leather anglerfish, a deep sea animal that uses a shining lure supported above its mouth by a piece of bone that bends over its head like a fishing rod to entice prey. 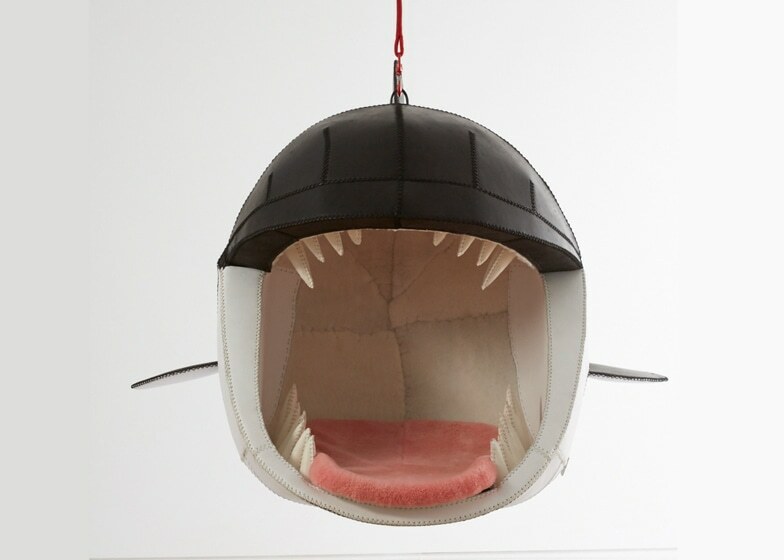 For the seat, the lure has been replaced by a light that dangles above its white plush-lined mouth. 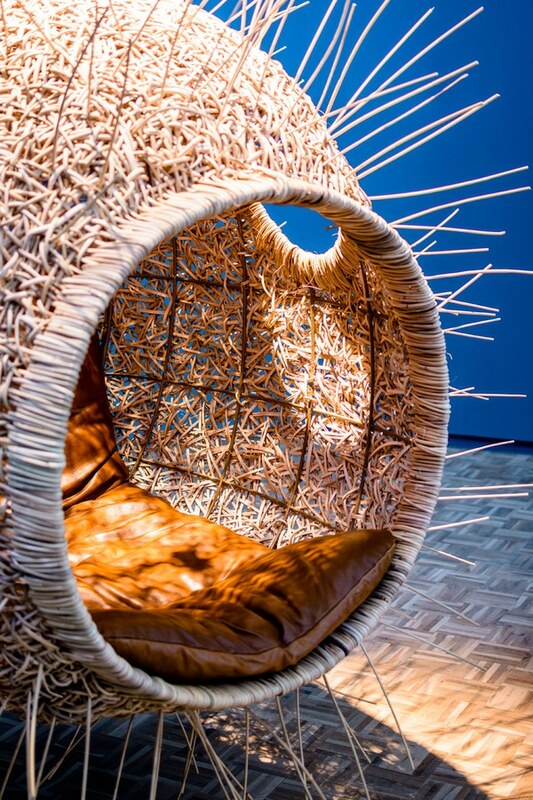 Each of the seats, which the gallery describes as "nest environments", is made using traditional South African craft skills, including weaving, stitching and splicing together different fibres. 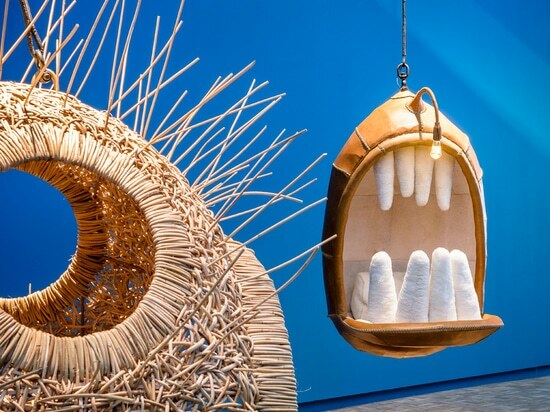 "My pieces get people to think about nature, and its fragility, and make them consider how to protect it," said Cape Town resident Hefer, who spent 16 years in advertising before moving into collectible design. "They're also about protecting local crafts so that these traditions don't die out," he added. Hefer worked with local craftsmen on the collection, including weaver Ismael Bey. "No one is playing with these skills in this way," said Hefer. "People are latching on to technology, but this evolves so quickly that its hard to benefit from it, because by the time you master a technological aspect it's already dead." "Ismael has trained weavers at the Cape Town Society for the Blind, where I've had a lot of my designs produced," he added. "In this way, I use his traditional knowledge and weaving skills and subvert these into non-traditional forms, making them more relevant." Hefer quit his career in advertising in 2007 to start his own creative consultancy, Animal Farm. 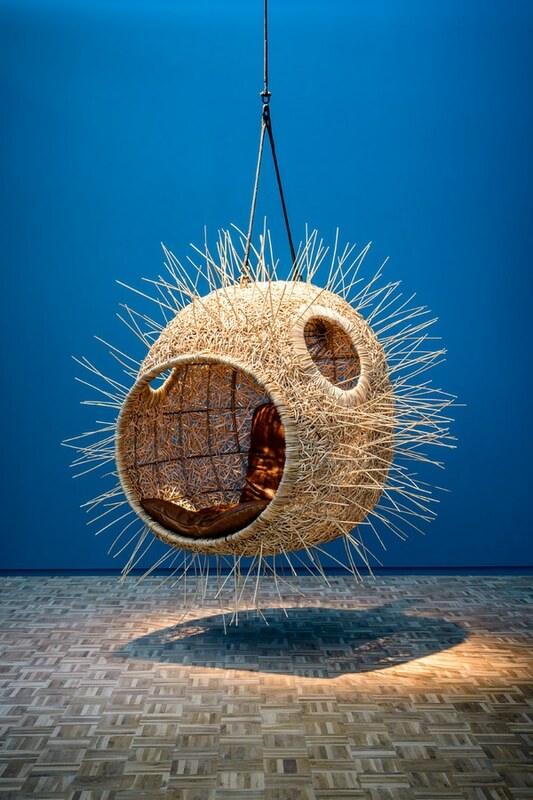 He founded Porky Hefer Design four years later, and integrates traditional African skills into all of his projects. Monstera Deliciosa is a development of Hefer's ongoing nest designs, a series of encompassing seats and snugs. 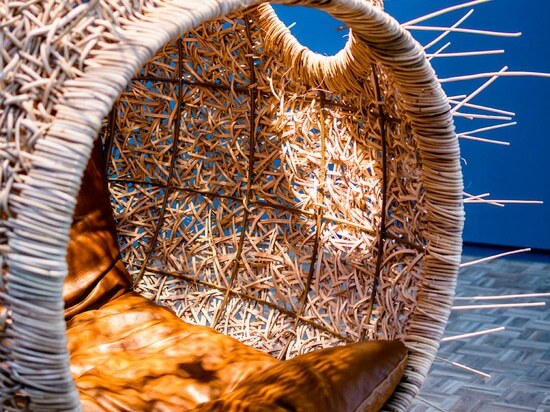 His 2009 Weaver's Nest was a woven wooden lounger that could be hung in a tree and reached by a rope ladder. Other designs currently on show at Design Miami include an obsidian and 3D-printed metal table by Janne Kyttanen and loopy chairs made from metal tubes by Aranda\Lasch.